Now, with 11 pieces of vinyl safely under its belt, Vakant invites the turntable-impaired to join in the fun with the release of Momentum, the label’s first CD. 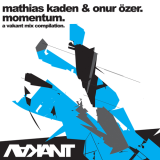 Not simply a compilation of hits, Momentum recreates the feel of Vakant’s infamous parties at Berlin’s Watergate club with a seamless mix of 14 of the label’s most propulsive tracks, expertly blended by Mathias Kaden and Onur Özer. In contrast to the prevailing trends in mix CDs – either resolute analog purism or fussy, edit-heavy digital sessions – Momentum strikes a middle path. After plotting the CD’s track selection, the tag-teaming duo banged out the mix in true old-school fashion using two Technics 1210s, a CD player and a sampler. Afterwards, they went back and judiciously added samples from elsewhere in the Vakant catalog, from diamond-hard staccato accents to lush ambient washes. The result is an ever-spinning, constantly mutating vortex that draws the listener in via propulsive rhythms and jagged hooks, and then pulls out the rug with subtle upsets and topsy-turvy layers. In good dubplate style, the mix features several unreleased tracks: Kaden’s “Nuance,” Özer’s closing “Untitled” and VX artist Spenza’s “kunstfehler,” which kicks off the mix in a haze of oily static before “Nuance” cracks things wide open with chugging polyrhythms and faraway drones that set the tone for the remainder of the mix’s dry whirlwind of dirty beats, disorienting effects and subliminal voices. The CD also features bonus material in the form of two videos by Spenza, featuring the artist’s original music and visuals, and rounding out the release as the rare project designed to stimulate the ears and eyes. Just as black holes aren’t empty at all, Momentum proves that despite the label’s name, Vakant thrums with commanding grooves, unique sounds and compelling visions for dance music’s alternate future. Power up to warp speed and hang on.